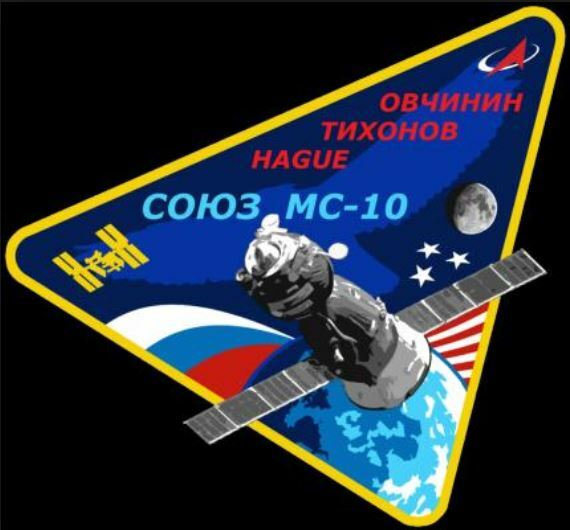 Many of my readers will be aware the Soyuz MS-10 spacecraft failed to get into orbit on Thursday 11 October. It was on a mission to take fresh crew to the International Space Station (ISS). A major fault occurred at an altitude of about 50 km when the booster rocket failed, causing the spacecraft to start falling back to Earth. Fortunately, the space capsule containing the crew separated successfully from the faulty rocket and the astronauts landed unharmed. The Russian Space agency is now investigating the cause of the failure. The next mission to rotate the ISS crew, Soyuz MS-11, was scheduled to take place on 20 December, but this has now been put on hold. Hopefully the cause of the failure will be identified and rectified, enabling the launch to happen as originally planned. However, if Soyuz is grounded for a longer period then the existing crew will have to abandon the ISS (using a Soyuz spacecraft which is attached to the station) until Soyuz is allowed to fly again or American missions start. This would be the first time that the ISS has been unoccupied since Nov 2000, when the first crew arrived. This failure underlies how dependent America and the other nations are on Soyuz, a spacecraft first flown more than 50 years ago. For the rest of this post I’ll talk about this spacecraft which has effectively become the space station ‘taxi’. On 23 April 1967, six years after Yuri Gagarin had became the first man to go into space, a Soviet Soyuz spacecraft was launched carrying cosmonaut Vladimir Komorov. He completed 18 orbits and then returned to Earth. Sadly, during reentry the parachute failed to open properly and the spacecraft was destroyed when it hit the Earth at high speed and burst into flames – killing Komorov and giving him the unfortunate distinction of being the first person to die in space flight. Despite this initial setback, the Soyuz spacecraft was successfully flown back into space the following year, when cosmonaut Georgy Beregovoy, a decorated World War 2 hero, completed 81 orbits and landed safely. Since Beregovoy’s mission, Soyuz has been launched into space a further 137 times, and has proved to be a great success, outliving the vastly more expensive technologically advanced Space Shuttle. It has established itself to be a reliable and safe way of getting into Earth orbit. In fact, since the retirement of the Space Shuttle in 2011, it has been the only way of getting astronauts to and from the ISS. A fact worth bearing in mind given the somewhat tense relationship between Russia and the West. The Soyuz spacecraft was designed in the Soviet Union in the early 1960s. The chief designer was a man called Sergei Korolev (1907-1966), who was the driving force behind many of the early successes in the Soviet space programme. 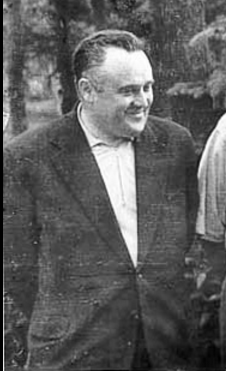 Korolev had a chequered career. In 1938 he fell foul of the authorities and was arrested by the Soviet secret police, tried and sentenced to death. The sentence was reduced to imprisonment and he spent number of months in a Soviet gulag – a hard labour camp – in a remote part of Siberia. Conditions were extremely harsh and many prisoners died from cold, disease and sheer exhaustion. 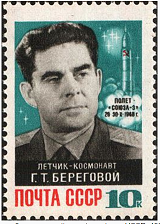 Towards the end of the Second World War he was rehabilitated by the Soviet government and rose up the ranks in the 1950s to head the space programme. He died in Jan 1966 at the age of 59, his final years plagued by ill health caused by his time in the gulag. In the 1950s and 1960s the Soviet space programme was kept under intense secrecy and, unlike his American counterparts, Korolev was unknown outside a small elite. His achievements were only made public after his death. The reentry capsule (labelled B) is shaped like a hemisphere and is the only part of the spacecraft which returns to Earth. The cosmonauts enter the capsule just before reentry. It is very cramped and is only designed for the crew to stay in for a short period of time. It does not, for instance, have a toilet. 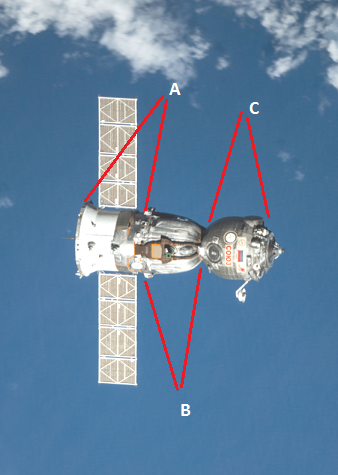 The spherical-shaped orbital module (labelled C) is where the crew live during a mission, although because all Soyuz missions are at the moment to and from the ISS, astronauts only spend a short time there. At launch the spacecraft sits on top of a 45 metre (150 feet) tall Soyuz rocket. The solar panels are folded away, and are unfolded when the spacecraft is in orbit. As mentioned above, conditions in the reentry capsule are very cramped. It carries a crew of three squeezed into only 2.5 cubic metres of usable space. This is the volume of a cube measuring 1.36 by 1.36 by 1.36 metres. These cramped conditions meant that, in the early Soyuz spaceflights, the cosmonauts couldn’t wear bulky spacesuits and the associated life support equipment. This unfortunately lead to the deaths of the cosmonauts in the Soyuz 11 mission in 1971 who suffocated when a faulty valve caused all the air to escape from their capsule. Had they been wearing spacesuits they would have survived. After this accident Soyuz was redesigned to carry only two cosmonauts, both wearing spacesuits, although this was later increased back to three. The redesigned spacecraft was known as the Soyuz Ferry because its mission was to transport cosmonauts to and from the Salyut space station. 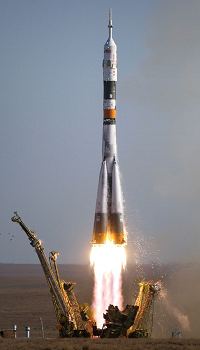 Over the last 50 years Soyuz has gone through several further updates and the latest version, known as Soyuz MS, was first launched in July 2016. The upgrades are mainly to computers, electronics and navigational systems and the internal layout of the spacecraft. The fundamental design hasn’t changed since Kamorov’s first flight back in 1967. A safe and reliable way of getting into space. Since 1971 there have been no fatalities on a Soyuz mission and the spacecraft has proven itself to be a safe, relatively cheap and reliable way of getting people to and from the International Space Station (ISS). The recent failure was the first for 43 years and it important to emphasise that the astronauts escaped unharmed. In 2011 the cost of a flying a Space Shuttle mission to the ISS worked out at about $500 million in today’s money (NASA 2011). In contrast, the cost of using the older Soviet-era Soyuz technology worked out more than eight times cheaper at the equivalent of $60 million per mission (Wade 2016). The table below shows the number of missions flown by the Apollo, Soyuz, Space Shuttle and Shenzou spacecraft. Only manned missions are included. So, although the Shenzou spacecraft has gone into orbit 11 times only 6 of these missions had humans aboard. NASA pays Russia $70 million per seat for each astronaut who flies in Soyuz (Wall 2013). This figure, which is roughly the same as the per seat cost of the Space Shuttle ($500 million for a crew of seven), enables the Russian space agency to make a significant profit. However, NASA won’t be entirely reliant on buying seats on Soyuz for much longer. As readers of my blog will know, rather than designing and building new craft to fly crew to and from the ISS, NASA administers a US-government funded programme called Commercial Crew Development (CCDev). After a lengthy evaluation process NASA announced on 16 September 2014 that Boeing and SpaceX had received contracts to provide crewed launch services to the ISS. When the final decision was made, NASA hoped that the winning companies would be able to launch manned missions to the ISS by 2017. However, perhaps unsurprisingly, there have been numerous delays in the development of both spacecraft and the launch dates have slipped. However, it must be be pointed out that they are only target dates and it is possible that they will slip further. 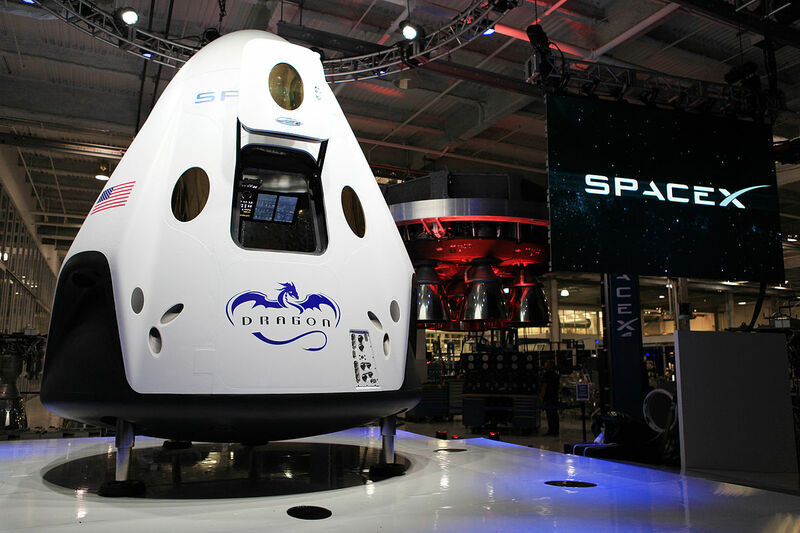 If there are no further delays and these test flights do take place as planned and are successful, then in June 2019 the SpaceX Dragon v2 spacecraft will be the first American spacecraft to carry astronauts into orbit since the retirement of the Space Shuttle. This will be followed by the Boeing CT100, shown below, in August 2019. In the longer term Soyuz is due to be replaced in 2023 by a new spacecraft called Federation. The design of Federation is still at the early stages but it will be capable of both low Earth orbit missions such as ferrying astronauts to and from the ISS and also missions deeper into space, such as orbiting the Moon (Nowakowski 2016). 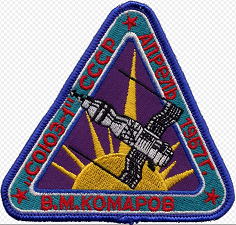 1 The total includes all Soyuz missions which were launched with humans on board, including the two missions where the spacecraft failed to get into orbit. 3 to the Skylab space station in 1973 and 1974. 1 joint mission with the Soviet Union known as Apollo-Soyuz in 1975. 3 The total of 135 Space Shuttle missions includes the ill fated Challenger mission in 1986 when the spacecraft broke apart 73 seconds after take off. NASA (2011) How much does it cost to launch a Space Shuttle?, Available at:http://www.nasa.gov/centers/kennedy/about/information/shuttle_faq.html#1 (Accessed: 15 October 2017). Nowakowski, T (2016) Russia runs first tests of its next-generation “Federation” manned spacecraft, Available at: http://www.spaceflightinsider.com/organizations/roscosmos/russia-runs-first-tests-of-its-next-generation-federation-manned-spacecraft/ (Accessed: 15 October 2018). Wade, M. (2016) Cost, Price, and the Whole Darn Thing, Available at:http://www.astronautix.com/c/costpriceanholedarnthing.html (Accessed: 15 October 2018). Wall, M (2013) NASA to pay $70 Million a seat to fly astronauts on Russian spacecraft,Available at: http://www.space.com/20897-nasa-russia-astronaut-launches-2017.html(Accessed: 25 April 2016). Yet another enjoyable and info packed post! Thanks! As I understand it the Russians are working also on the replacement of the Proton launch vehicles by a new rocket family Angara. Economically quite a burden since Russia’s GNP is not more than the GNP’s of the Netherlands, Belgium and Luxemburg together. My first thought when I heard about the failure was, ‘please don’t let them be dead’. Yes they were very lucky to escape unharmed. I know Soyuz is a really impressive and reliable spacecraft, but I’m very much looking forward to SpaceX and Boeing’s missions. It’ll be nice to have other options for getting to the I.S.S. for a change. Really fascinating stuff here, I’m glad I stopped by. I learned something, so thanks!